A professor was teaching his class about people and feelings. He gave everyone the following exercise to perform. He had the students take a piece of paper and told them to crumple it up, stomp on it and really mess it up but do not rip it. Then he told them to unfold the paper, smooth it out and look at how scarred it was. He then told them to tell the paper that they’re sorry. Now even though they said they were sorry and tried to fix the paper, he pointed out all the scars they left behind. And those scars will not go away no matter how hard they tried to fix it. The professor went on and told the class, that this is what happens with people and their feelings too. You can hurt someone, mess them up once or twice and they will forgive you because they love you. But if you keep stomping on them and their feelings repeatedly, you will give them scars that might not go away. Appreciate people who give you their time. Respect their feelings for you. The feeling can be love, care, worry, friendship, trust, happiness, concern. And it could be coming from anyone, you mother, father, brother, sister, friends or even a neighbor. Value the once who value you. A few words of kindness and appreciation can make someone’s day. Don’t give them scars that can’t be healed. 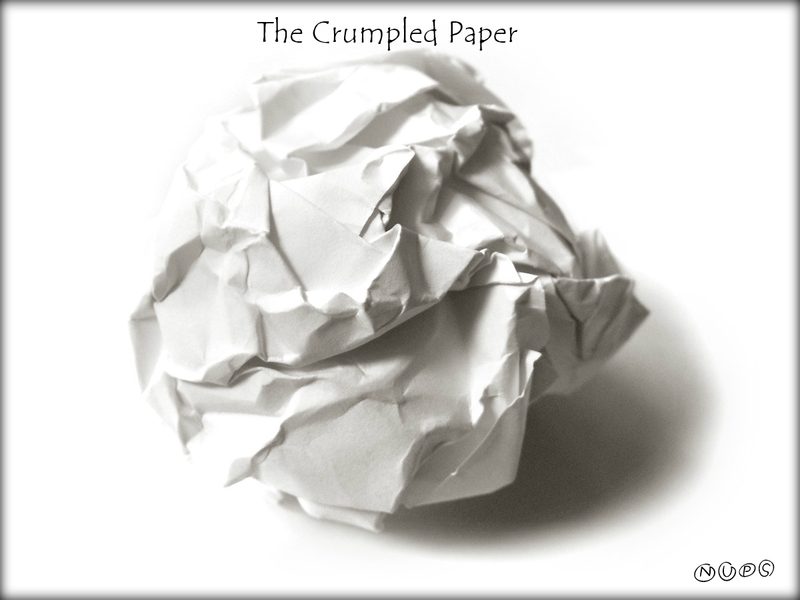 You don’t want to be remembered as the one who crumpled them. After all, their feelings are for you and your best interest. The Gayatri Mantra.. should be recited, with eyes closed, 11 times a day, for mental peace..
Aum Bhur Bhuvah Swah, Tat Savitur Varenyam..
Bhargo Devasya Dhimahi, Dhiyo Yo Nah Prachodayat..